Hot-on-the-heels of unveiling their new single Heathen Child - complete with its fantastically insane video - Grinderman have revealed a remix of the track with added prog guitar. 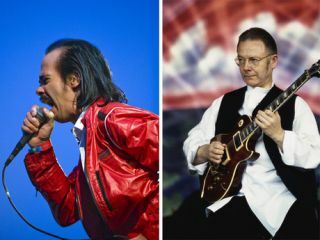 The new track is called Super Heathen Child and sees the band team up with former King Crimson guitarist and prolific collaborator Robert Fripp, who adds a two minute guitar solo to the track. Grinderman, who are a spin-off band comprised of members of Nick Cave And The Bad Seeds - including principle members Nick Cave and Warren Ellis - will release their second album Grinderman 2 on September 13th.